Reigning European Electric Touring Car Champion Ronald Volker has successfully completed the first stage of his title defence by securing the TQ, putting his LRP powered Hot Bodies at the front of the grid for tomorrow’s triple A Main Finals. Volker has been on form throughout qualifying securing victory in four of the five heats with the only blotch in his text book performance being a stripped front belt at the start of Heat number 2. Volker, who was confirmed as the Top Qualifier after Heat 4 when Viktor Wilck got in trouble for late marshalling, produced the fastest time for the final qualifier ahead of a very improved Teemu Leino. With a fresh spool fitted to his car for the run Volker said his Cyclone TC was the best it has been yet and it felt really good. Asked if the TQ honours brought on any extra pressure the German said it didn’t and knowing that his car works so well he felt really good ahead of the finals. Speaking about who he expected to provide the greatest challenge tomorrow he was quick to name fellow countryman Marc Rheinard who will start from P2 on the grid. Second fastest in the final run and looking much happy then he has since the start of qualifying was Teemu Leino. The Team Xray driver has finally found a set-up that helps his T2 008 to get the most from the controlled Sorex tyres. The Finn says a very quick opening lap will be so important to the results of the final and believes he has cracked the tyre warming temperature needed to give him a fast opening lap while not causing the tyres to go off as much during the run. Rheinard appeared much more upbeat with his car after the final heat describing it as pretty good. Finishing a second off Volkers time, the Tamiya Racing Factory team driver admitted to making a ‘stupid mistake’ during the run when he jumped the curb at the chicane and ran onto the dusty part of the track. A former World Champion who knows his competitors very well said the competition here is super close and believes anyone of the 10 drivers in the A Main can win tomorrow. 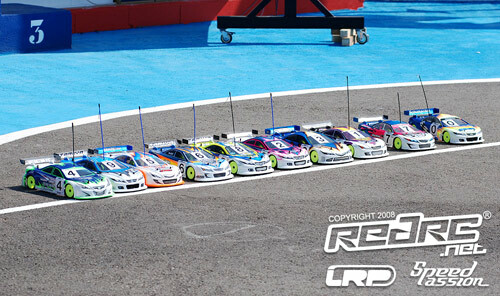 The final is an impressive line-up of World class drivers. While Volker and Rheinard occupy the front row behind them we have Pre World’s Race winner Viktor Wilck and current World Champion Andy Moore. Wilck is enjoying a very good season, having also won the DHI Cup earlier in the year, and Moore’s title says enough about his abilities although the Englishman is still struggling to find a consistent full race distance pace. Row three is made up of two more international champions with Teemu Leino, the TITC Champion, and Jilles Groskamp who is the Euro Touring Series Champion. On the penultimate row it is Corally ace Marc Fisher and last year’s Top Qualifier Steven Weiss while top Swede Alexander Hagberg and Euro Warm Race winner Elliot Harper completing the line up for what is set to be three cracking Legs of racing tomorrow. The unfortuate and dreaded 11th place went to Tamiya team driver Hupo Honigl who actually finished on the same points as Harper but the latter had a higher finish in his best run. Its the most important race of the year in Europe for manufacturers involved in EP Touring cars and in the pits we caught up with some of the key players who are here to support both their team drivers and the many privateer racers who make up the 144 entries. 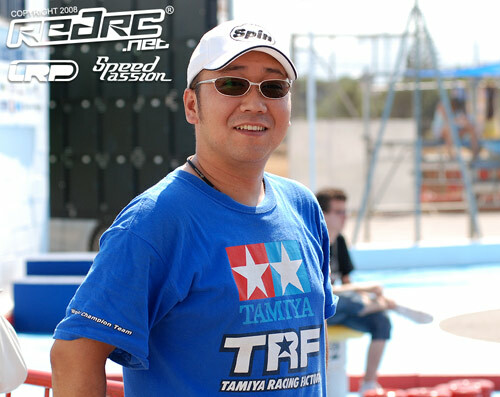 Senior Designer with Tamiya, Kiyo Suzuki has made the long trip from Japan to Spain to support their four factory drivers Rheinard, Wilck, Groskamp and Honigl. Kiyo, who is super impressed by the Nitro 15 track, has brought along new parts for the team to try such as a new rear shock tower and is pleased with the performance of the TRF416 here so far. Talking to him about the upcoming Worlds, Kiyo believes that 5 cell is already fast enough and with six cells to be run in Thailand the cars will be way too fast. As a result of the extra speed and the local weather conditions in Bangkok, they plan to run a modified TRF416 which will better handle the hot track temperatures and the extra demands put on the drive train. 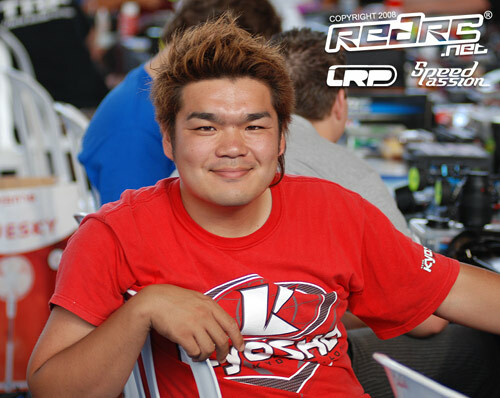 Also making the trip over from Japan is Kyosho development driver Shin Adachi. Shin, who himself races regularly in Europe, is here to help Steen Graversen and Christopher Krapp who are both running prototype Stallion chassis’ which will form the basis of their next production kit. Shin told us that the car being used here in Spain will remain pretty much unchanged for the Worlds however extensive testing is planned in Thailand shortly. The very pleasant Terutaka Hanaumi from Xenon Racing Products is present to highlight their range of gears, traction additives and accessories. Very well known in the Japanese market, Xenon have a growing number of distributors in Europe and feel it is important to be seen at such big races and to support the large number of drivers using, in particular, their gears. Two European chassis manufacturers with support on hand are Xray, the most popular chassis here at the championships, and Corally. Juraj Hudy the founder of Xray and the man responsible for penning the designs of all Xray cars is himself taking part in the event. Racing the T2 008 allows Juraj to better understand how the car works on the track which is in turn a huge benefit when working on set-up with his team drivers. Suzanne Siegel is over from the Netherlands to look after the large contingent of Corally drivers. With Marc Fisher set for a place in the A Main, Suzanne is very happy with the progress of the prototype RDX Phi car being used by the German. The Dutch company are very busy working on the prototype of their yet unnamed next generation 190mm car for the Worlds but Suzanne told us the car will share a lot of common parts with the current RDX Phi. As is to be expected at EP Euros there is plenty of support from the electric components manufacturers. Oscar Jansen, himself a former European Champion, drove all the way here from Switzerland due to the large number of cells he needed to bring with him. The Dutch motor guru is busy working with the top Team Orion drivers like Steen Graversen, Andy Moore and Steven Weiss and is also pitman for Teemu Leino. Head of Development at GM Racing, Ralf Helbing is here to over see the new Genius 120 speed controller which is being used by 10 of the German company’s team drivers. From the small first production batch, the new ESC is proving its worth in Fisher’s car and Ralf tells us the main production batch should be ready for general release at the beginning of September. 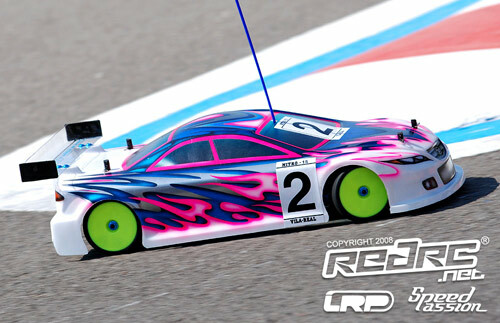 One of the sponsors of our live Red RC coverage for the Euros, LRP are also present supporting defending champion Ronald Volker and their other star drivers. Reto Koening, who is responsible for R&D and managing the LRP race team, is here along with Steffen Leinburger whose main duty is to be mechanic for Volker. Reto says he is very busy due to the large number of drivers running their products and from looking around the pits their Sphere speedo is the dominant force among the field. Interestingly LRP brought 50 motors and 80 battery packs to this event. More action from Vila Real in which we see Heat 15 take to the track for their 4th round of qualifying. This race saw Marc Rheinard in top spot for a large portion of the race but Ronald Volker came good in the dying moments to take the win. 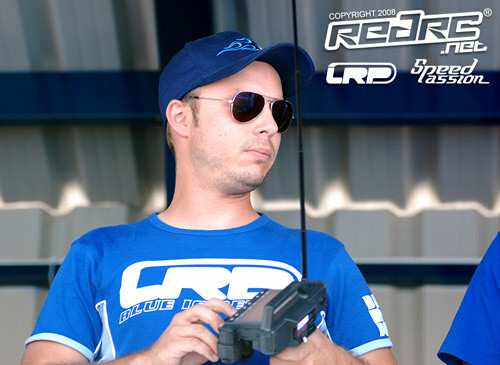 Ronald Volker has been confirmed as the top qualifier here in Vila Real. The only person who could deny him TQ honours, Sweden’s Viktor Wilck has had his fastest time taken away for not marshalling the fifth and final qualifier. While the Tamiya driver is still guaranteed a position in the A-main on Sunday, he will now most likely start from row 2 unless he can TQ the last round which is currently underway. 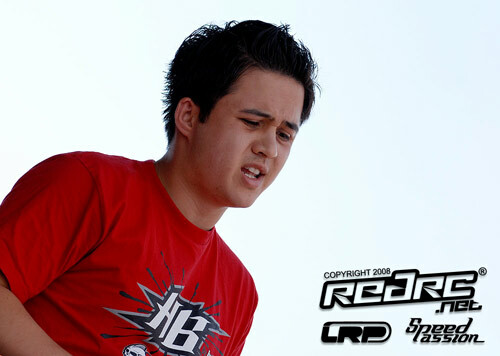 He is the defending champion and he is proving he is still at top of his game taking yet another round TQ here at the 2008 Euros. Ronald Volker and his Hot Bodies have just notched up their third qualifier victory and one can only presume the German would be holding four wins from the four heats run so far if it were not for a stripped belt in Heat 2 yesterday. Volker once again complained of his car being very loose at the start of the heat. 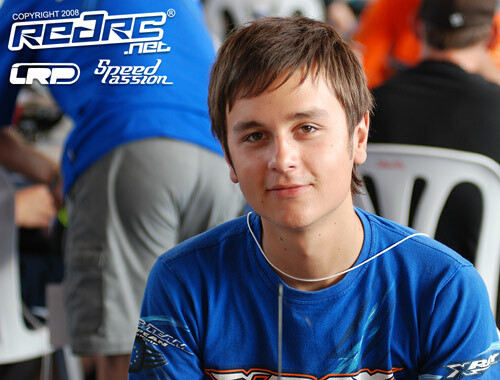 The problem was bad enough that he had to let his only overall TQ challenger Viktor Wilck through early on in the run. Once the opening minute was completed the LRP team driver’s Cyclone TC improved but it would appear that the early handling problems aren’t effecting his overall performance too much. 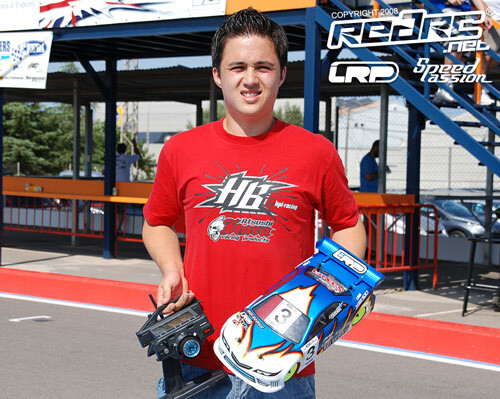 Again finishing second to Volker, Marc Rheinard has made further progress with his Tamiya. Running harder oil in his shocks he said the car is better in the middle part of the race but now they need to find an in between setting so as to improve the TRF416 for the beginning and the end of the run. Rheinard had been in a very close fight for the heat win for much of the heat with Andy Moore but both fell off the pace in the last few laps. Viktor Wilck, the only driver left who can deny Volker the TQ, was also on for a possible fastest time but believes he overheated his tyres. While he says it will be difficult to beat Volker’s fastest TQ run due to the warmer track conditions he will definitely try. The Swede hopes less time in the tyre warmers will mean his tyres last the distance in the final qualifier. Andy Moore, who again recorded the fastest lap for the round, continues to be at a loose end as to why his Hot Bodies is dropping off the pace by 3/10th a lap over the last four laps. The British ace said he has no corner speed over the last minute and has no idea why. Still thinking of what he can do to cure the problem, the World Champion looks set to try big changes for the final heat and the morning’s Final practice in his quest to get what is a very fast car for four minutes to work right through the full 5 minutes. Corally’s main man Marc Fisher was fifth for the round with Hupo Honigl making it four Tamiya’s in the Top 6 after recording the sixth fastest time. In the overall ranking with one round of qualifying remaining Volker holds the pole from Wilck, with Rheinard, Moore, Groskamp, Fisher, Hagberg, Leino, Weiss and Honigl holding A Main positions. Unfortunately for Euro Warm Up race winner Elliot Harper he is in probably the most dreaded position, P11. Reigning European Champion Ronald Volker has ensured himself a front row start for the A Mains here tomorrow in Vila Real after topping the time sheets for a second time in qualifying. The Hot Bodies/LRP driver won the opening heat of Day 3 of the Championships with the fastest run we have seen yet and with the best two of the five heats to count the German will at worst start from No. 2 on grid. 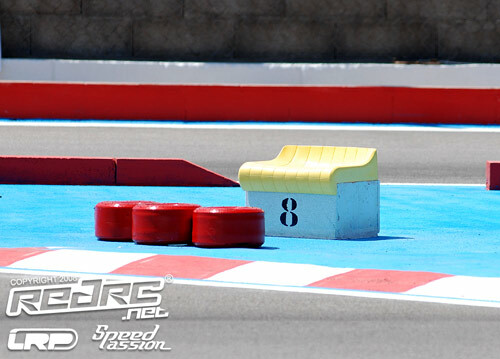 The only thing that can rob him of the pole is if Viktor Wilck can produce another win in a faster time than the current best of 17 laps in 05:04.574 or one of his rivals should dominant the final two qualifiers. Volker said the run felt like there was more traction but that his Cyclone TC was a little loose on throttle. He suspects this might be related to his diff which he will now check but other than that he will leave the car the same for the penultimate qualifier. Second for the round was fellow countryman Marc Rheinard. The Tamiya driver says his TRF416 is still not perfect but that a switch a lightweight bodyshell was an improvement. With a second and a third to his credit the former World Champion currently sits third in the qualification rankings just behind team-mate Wilck. Jilles Groskamp described the pace here in Spain as very close after finishing third fastest despite a costly slide on lap 9. The Dutch ace is assure of a place in the A Final and so will use the remaining two heats to test for Sunday’s finals. Groskamp will try a new rear shock tower, which was brought over by Tamiya Senior Designer Kiyo Suzuki, and with more holes this allows finer adjustment to the rear shock position. He also plans to raise the front camber link to increase mid corner steering. Fastest Xray in Heat 3 Alexander Hagberg is a lot happier with his T2 008 after trying the same set-up as Warm Up race winner Elliot Harper. The 18-year-old Swede described the car as very good and feels now he has the pace to make the A Main. Just behind Hagberg, also driving an Xray, was last year’s Top Qualifier Steven Weiss. Switching to harder rear springs the German said his T2 008 was better and plans to change shock oil for his next outing. Andy Moore, who recorded the new fastest lap with a 17.522, completed the Top 6. Englishman Olly Jefferies enjoyed his best run so far with the seventh fastest time followed by Kyosho’s top challenger Steen Graversen, who was just 3/100th off Jefferies time, Hupo Honigl and Marc Fisher who had a differential problem.